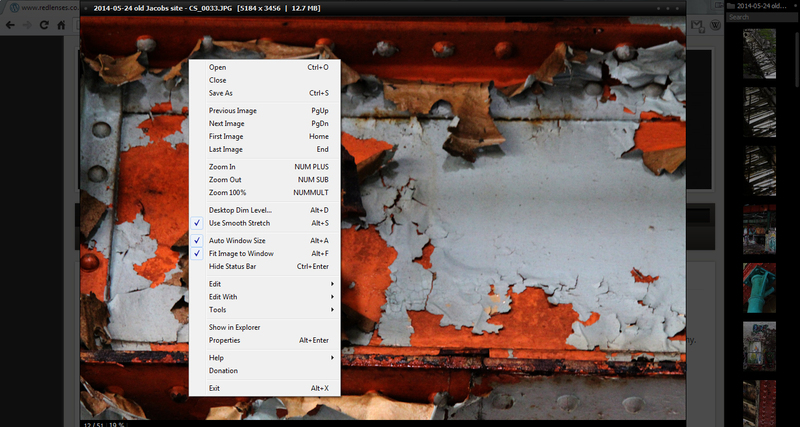 I’ve just installed a new, lightweight image-browser for Windows (not image-editor, just to avoid any confusion). Now, I know that there are a lot of them out there, and I don’t have the time to play around with them all for comparison, but this one grabbed my interest: nexus image – no connection to the Google Nexus. Or anything else you can think of with the word ‘nexus’ in it, come to that. It is lightweight, portable (no registry alterations, so you could put it on a USB stick along with images, if you are visiting a client), and nicely simple. Plus it can be set up to open any image-editing software you have, which can then by accessed using keyboard shortcuts: If you are doing this for a few hours, the saving in time and effort of mouse-movement makes this approach much more user-friendly for me, as I’ve been using Windows Photo Viewer for … well, for ever, it seems! I can also customise both the desktop dimming-level and also the colour of this; I find the default settings are fine, and much easier on the eye than the white background of the Windows viewer. Again, nice for prolonged use, I suspect. Within the viewer itself, you can pretty much only rotate or flip the image (as with the Windows version), but I don’t need cropping or other tools here; I’ll go to Photoshop for that, and take the trade-off in speed. OK, it can be a little slow at building the thumbnails down the right of the screen, even on my fast PC tower, but I can live with this (or turn off this feature, if I can’t live with it!). Also, a nice EXIF window, if needed. I’ll need a little more time with it, but first impressions are very favourable, so why not download a copy of it here. Oh, and did I mention that it’s free? Well, it is! But if you like it, why not make a donation, as I will do once I’m sure about it. Happy viewing! [Edit] I’ve removed the links for this post, as it is no longer available to download.